Today's tip is all about recycling your posts and increasing their mileage. 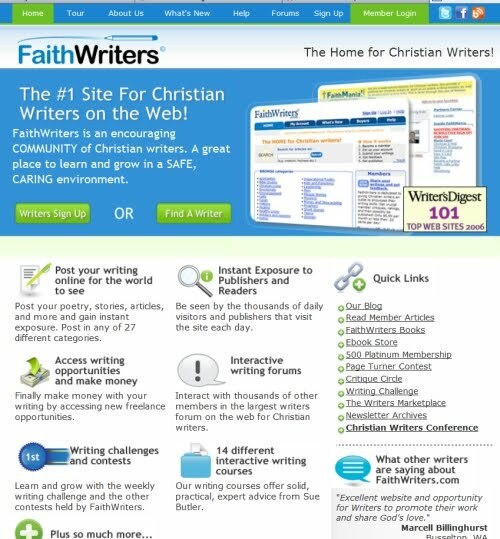 Faithwriters is where I got my writing start. When I joined the group I was scared, no that's not true. I was terrified. They welcomed me, encouraged me, nourished me and taught me oh-so many things. They also were part of what gave me the courage to step out of their safety zone and start blogging, which led to everything else I now do. One of the cool services Faithwriters provides is the Free Articles for reprint section. It's a place where people who need articles for newsletters--online or in print--can go for a selection on many topics. 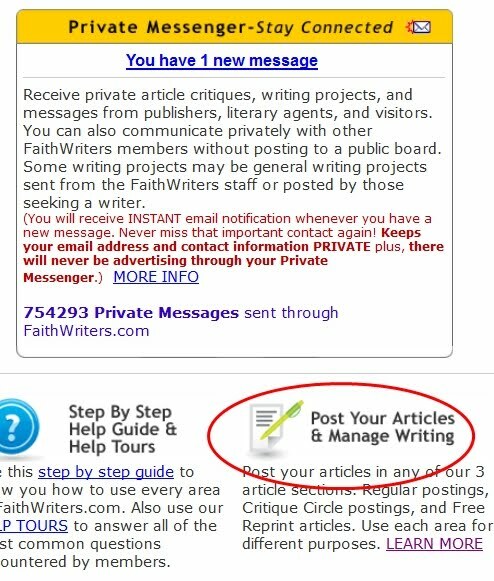 The articles are free to use, they must simply credit the writer and and link to them, as well as to Faithwriters. It's a great service. 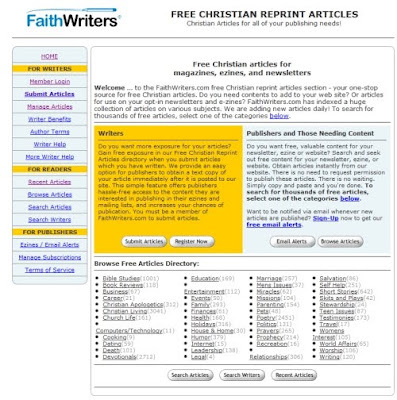 As a member of Faithwriters, I put a few articles into the Free Reprints. Okay, 48 to be exact but 2 of them are in twice, in different categories, so they're listed and counted twice. 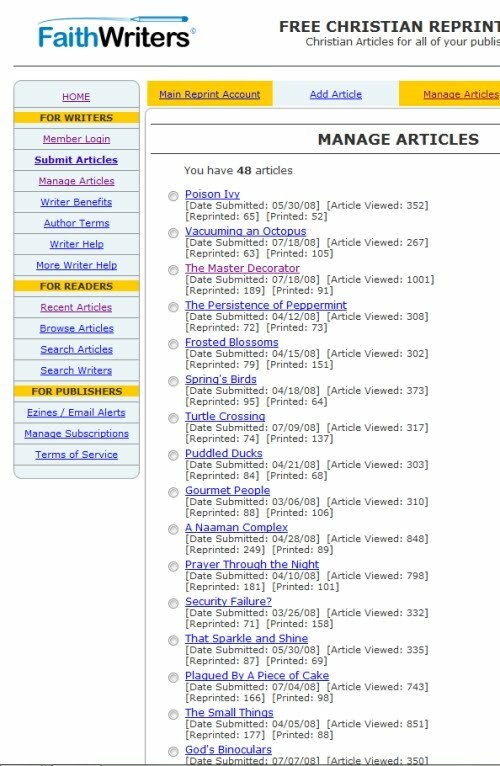 Those 48 articles have been "reprinted" over 4600 times and "printed" over 3500 times. True, they've been there, available for 3 1/2 years, but still, if I hadn't posted free article there those are hits I would've entirely missed. Even if they were only actually used a quarter of those times, it's still more than I would've had. And you know what? Those 46 articles were things I wrote for either the Faithwriters Weekly Challenge (but that was only a few) and for my blog. That's great mileage! Granted, I don't know who used them. I don't know where they were used. But over time my Google Alert has kicked back to me several links where one of these articles were used. They've shown up many times in online magazines, ezines, church websites and newsletters, Christian radio newsletter, and it's always a little thrill to find them. On the business side of writing, these things help build my platform--and once I posted them in Faithwriters Free Reprints, I haven't touched them. LoL. I usually forget all about them until an alert comes in. Articles that are racking up great mileage AND that work for me. Can't argue about that! 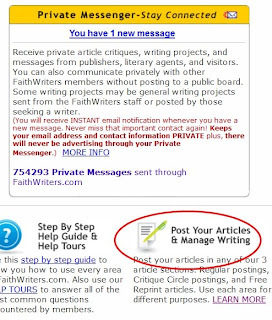 Posting articles in the Free Reprints is as easy as entering the Faithwriters Weekly Challenge. 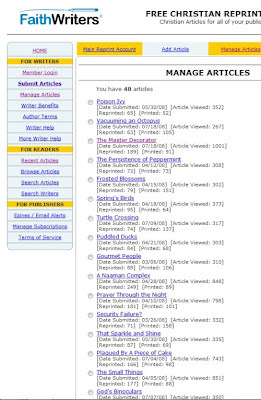 Login and click on the link to Post your articles and manage writing. So tell me, have you posted articles in the Faithwriters Free Articles or a different article service? I'm celebrating, the blogging class I teach, Clearing the Blog Fog, is 25% off for October's class and there's a bonus tutorial I'm throwing in: How to Use Paint.net, which is the free photo manipulation tool I use to make headers, buttons and banners. Class is October 1 - 31 and it walks your through, step-by-step, setting up, maintaining and customizing your blog. I definitely use free reprints - though I haven't put anything up in a LONG time. Really should! I also pull articles for the FW blog from there. Thanks for stopping by, Jesse! Glad you find it helpful. Thanks for explaining the free reprints in more detail. I have looked at that, and now I have a better understanding of how it works. Thanks for the reminder, I haven't post anything in free reprints in a really loooong time!